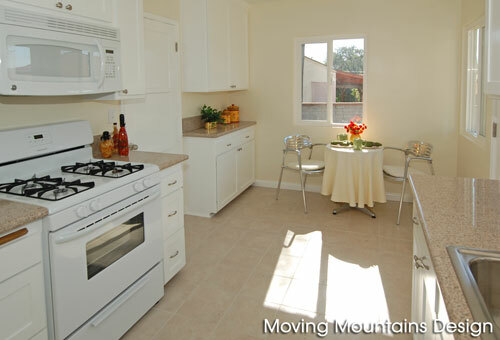 Home buyers in the Los Angeles real estate market want a house that is move in ready. Home buyers don't want an allowance to repair the roof, replace the carpet or repaint. Allowances are for teenagers. They want a well priced home, in a decent location, that they can move right in to without spending another dime. Its a big fallacy that home buyers want to choose their own carpet or paint colors. If you choose a nice, neutral color carpet and nice neutral color wall paint (both things the best home stagers can help you with) most home buyers will see your home as more desirable because it is move-in-ready. They'll be thrilled they don't have to worry about picking out carpet and having it installed or find a painter who has time in their schedule. If your home stager can't help you with this, then you are working with the wrong home stager. The buyer thinks "What else didn't they repair that they should have?" The buyer thinks "What structure got damaged by the leaky roof?" The buyer thinks "Is it really going to cost only $5,000 to repair the roof?" The buyer thinks "How much time will it take me to get bids, hire a roofing company & get the work done?" The buyer thinks "What happens if (fill in the disaster: it rains, the contractor absconds with the deposit, a worker falls off the roof)?" The buyer thinks "The seller must be desperate since the house isn't in good shape." The buyer rejects your house and moves on to the house down the street that is move in ready. The buyer thinks "Will $3,000 really cover new carpet for the whole house?" The buyer thinks "I'm not from around here. Where do I buy new carpet?" The buyer thinks "That house down the street already has new carpet. Why should I take on the added stress of shopping for & installing new carpet?" The buyer rejects your house and moves on to the house down the street that is move in ready and already has new carpet installed. By not repairing and updating your home before you put it on the market, you are asking home buyers to assume risk and additional expenses. You add more stress and uncertainty to the situation. Many home buyers are already investing every penny they can get their hands on in order to purchase a home. They are unable or unwilling to purchase a home that will require repairs before they can move in. Additionally, the condition of your home may effect the appraisal causing the buyer's lender to refuse the loan. Want to get a Los Angeles home sold? Price it right, hire the best full service Realtor you can find, hire a professional home stager and make sure it is in move-in ready condition. Michelle - this is a good post and offers good thoughts for sellers to consider when they are selling their home. Thank you Chris and Sharon. Good explanation Michelle of why sellers should offer a move in ready home, rather than an allowance. We need to keep educating the public about this subject until they understand they're helping their home sell faster when the repairs are already taken care of! So true Michelle. I hope a lot of sellers read this. This is so true Michelle. Allowances are a red flag and get potentinal buyers looking for other red flags. Sellers want their homes to be free of any potential issues so buyers can fall in love with home, not find reasons not to buy it. Thanks for this. Maureen: I'm sure you encounter this problem too, in Portland. I laugh (and cry) when I hear home sellers say "We're not replacing the carpet because the buyer will probably want to choose their own". Buyers want to buy a house and move in. They don't want to have to go shopping for carpet, find someone to install it and go through the hassle. If the carpet and paint is fresh, and the home is nicely staged it will sell faster! Excellent points for any seller to embrace. It's a buyer's market now and we all know every advantage you can get when selling is a must. It's true be ready to sell people. Don't expect people to want to fix the things you never took the time to fix. They don't want to be bothered either. MOve in ready home are a cinch to sell! That first picture truely scares me! : ) Great blog post. You're right, no one wants an allowance. They want pretty, neat and ready to move. If it is not move in read, be prepared for either no offers or very low offers! I was just having this conversation this morning. Right now buyers are really not tolerating much of anything. They want the house to be perfect - no work left undone, no old kitchen... There is just too much to choose from out there. I never recommend a repair allowance. That's an open invitation to ask for more later. Love your before and after pics. My motto, to my home staging clients in Atlanta, is that "we want to give the buyers every reason to buy and not a single reason not to." A dated and stained carpet will NOT help sell the home. And as you point out, puts the prospective buyer in a position to further lower their bid. Huge mistake. Very well put! And I think I am going to borrow the "Allowances are for teenagers" line to sue on some of my sellers! This cannot be said often enough - especially in this market. Buyers also have trouble seeing beyond the yellowed wallpaper or dirty carpeting as much as we try to remind them to picture them without it. And, although allowances are for teenagers, if the Seller has to give an allowance (maybe they don't have the funds to do the repairs), then at least make it an allowance that will actually cover the repairs. Pet odors, smoke odor, and, for goodness sake, clean up that house! Thanks for the post! Happy Holidays! Michelle, this is right on target. Buyers will go to the competition, if the home isn't move in ready. Thanks. Excellent post! I really liked how you very clearly illustrated exactly what a potential buyer is thinking and feeling. Allowances for things which should have been taken care by the seller only give buyers reasons to walk away. Bob: You should have seen the rest of the house! Claudette: I think sellers have to weigh how quickly they want to sell vs. how much work they are willing to do to get a home move-in ready. The more they invest (wisely) the faster it will sell. Kathy: I love that! "Give buyers every reason to buy, and not a single reason not to." Richard: Please feel free to borrow that line. I hope it helps. Christine: If they can't make needed repairs, they should get quotes from contractors to prove their allowance is on the mark. Michael: Thanks! I always say "Don't give a buyer a reason to buy the house down the street". Great advice & a little pre-planning before your house goes on the market can actually save you thousands. Lyn: Its sad to see homes lingering on the market that would probably sell if they were made move-in-ready. BTW, thanks for reblogging this post. Great points Michelle. It can't be overstated that buyers have neither the time, money or the desire for DYI projects when they move into a house. I am reblogging the post to spread the word. Heather: Sorry I missed your response. We definitely don't want potential buyers to walk away. Linda: Thanks for the reblog! Who wants to spend all their money on a house, only to have to spend even more money to make it ready to live in? Erica: One way to prevent that is to get 2 or 3 bids for needed repairs to show to home buyers. But really, the best thing (and probably the most cost effective) is for the home seller to handle any repairs before they list the house. Not just in Los Angeles either, buyer's in Oakland are excited to write an offer if a property is move in ready. If it's not, then they would rather wait to write an offer once the price of the home drops, which really translates to not being that excited about the house. When repairs or updates need to be made, it's quite easy for a buyer to get distracted on the price of a home and how much it will cost them to buy versus thinking how exciting it will be to be a home owner and personalizing the home once they move in. Stagers are a great asset in teh pre-marketing stage when a buyer isn't listening to the agent and needs to hear it from another professional in the business. Elisa: That's a very good point. When a home buyer realizes there are repairs to be made, its easy for them to get distracted about cost vs. benefit of owning the home. So true: "Stagers are a great asset in the pre-marketing stage when a buyer isn't listening to the agent and needs to hear it from another professional in the business." Michelle, your scenarios are very real! I have had a difficult time convincing sellers to spend the money to stage a home. any suggestions? I had a listing that languished on the market until my seller got rid of the tenant, then painted and carpeted the entire house. It went under contract in a few weeks! Excellent post. Thank you for taking the time to help educate buyers and sellers with your posts. Good luck in 2011! Sharon: Don't we know it. You have a great home stager near you: Karen Otto. She knows your market well and will be the best one to help you convince your clients to pay for staging. I recommend her highly. Hella: New paint and carpet and definitely strong tools to help get a home sold. Deborah: Thank YOU! Happy Holidays! Its nice to note that these "simple" updates are not so simple. Some sellers feel overwhelmed at "what repairs should I make", they fail to think "If I'm overwhelmed, and I KNOW this house, how overwhelmed will a buyer be when the buyer doesn't even know this house yet?". Taking the time to help the sellers overcome these fears and organize the RIGHT steps is a good tool for all of us. Excellent post. Most lenders do not know how to use an allowance anymore. Lenders want the work done prior to closing. Escrows are pretty much a thing of the past. BTW-the mention of an allowance in the remarks says-"Get ready for an ugly house". Robert: The best listing agents and home stagers will be able to guide a homeowner through the repairs process. That is why its so important to hire the best! Kathy: Your comment made me laugh -"the mention of an allowance in the remarks says-"Get ready for an ugly house". So true! You are right. Unfortunately, there are a lot of home owners that can't afford to do the fixes. The house will appraise for more but it needs the repairs completed and paid out of escrow. It is a dicey game, because if it doesn't appraise a BIG problem comes in to play. Contractors need to be paid or a lein is placed on their property. MOVE IN ready is always the best way to sell a home. If buyers are getting a mortgage, the lender will not allow any allowances in the contract. It has the appearance of a buyer kickback or fraud. If the buyer is paying cash, an allowance is the same as lowering the price. Allowances are a thing of the past, not the present housing (and lending) market. It doesn't make sense that realtors are still talking about this. Am I wrong? Congrats on the feature! I think you hit the nail on the head with alot of this. There are the buyers who are looking for a complete redo house OR the house that is already done and not much in-between. Michelle, We have the same thing up here in the Bay Area. The Buyers have good incomes, but they have used all their cash for the down payment and closing costs. Most all of our "regular" sale homes are staged. The bank owned homes are nice because at least they are empty. The very toughest sale is the "short sale" where the owner or a renter still lives there and absolutely nothing has been done. 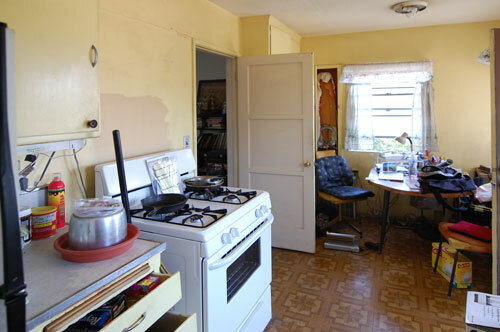 You kitchen "before and after" picture is fantastic and really tells a story. HI Michelle, absolutely agree. Your line about allowances being for teenagers is priceless. You really have brought the whole debate of whether to prep your house ready for sale versus offering an allowance to a fine point. Buyers are at their max most of the time when they are looking for a new home. By taking away the uncertainty of repairs after purchasing you can't help but make the decision easier for them to buy this house instead of the one down the street. This is for most people the single largest purchase they make. To create an impression of being move in ready will only pay off dividends to the seller and shorten the time on market. So glad I stopped in to read this post today. Well deserved featured post Michelle! If sellers only realized how much MORE money it's going to cost them NOT to do the things you've listed, I think they'd understand why it is so necessary to do it before buyer's object. I never recommend providing "allowances" and give similar scenarios to my clients (I like your "allowances are for teenagers"!) That money is better off being used to get the the home move in ready not sitting waiting for the buyer who may never come. Good post, but I think you can't say homebuyers in general. I mostly work with investors, and they are one category of homebuyers that love to see ugly homes with allowances. Of course this is because they are looking for a great deal, and not a beautiful home to live in. Clearly if your sellers are better off if they can avoid attracting investors over retail buyers though. Kim & Kristine: I've been hired by the buyers to help them once escrow closed. They liked the staging so much they hired me to make their new house feel like home. Thanks! Ric: I understand that some can't afford it, and that's unfortunate. I think more people can afford it than are willing to pay for it though. They still wind up paying with a lower sales price. Leah: What you're saying is true, but I still hear homeowners say they'd rather give an allowance that fix up the place. I still see "carpet allowance" or :"roof allowance" in the MLS all the time. Ann: I'm sure its the same story all over the country. The kitchen photos are from a home that I did a home staging consultation on. I hooked the homeowners (heirs) up with a real estate investor I stage for. She bought the house and made the needed repairs. The house sold in 2 weeks after we staged it! We're destaging on Tuesday. Jenny: Fixer Upper = lower price. You're right...either people want a severely discounted house or they want one that's move in ready. Thanks! I'm glad you stopped by too, Michelle! Thanks. Karen: Homes in better condition that have been staged will always sell faster and for more money. Joe: I agree. Investors do love ugly houses in need of repairs because they can get them for a much lower price. Most home sellers want to get a higher price though. But even real estate investors aren't immune to the idea they won't have to do anything to a house before they flip it. Persuading sellers to stage their homes in today's economy is difficult for the average RE property, however, i have found that the higher the price, the more cooperative the seller is to follow their RE agents recommendations. Kimo: I've had great luck helping to sell even the lowest price homes. Home staging consultations are pretty darn inexpensive when you consider how much more money the home owner may sell for. Boy you have hit the nail on the head. I wish more agents/sellers read this and understand this is how buyers will react. This reminds me of a seller I had who put in new carpet in the bedrooms and fresh paint throughout. The paint came from the "oops" section, and every room was a different color. The carpet was all remnants, and each room had a different color and type. So even though everything was new and fresh, it missed the mark. Debbie: Feel free to use it. Karen: Sound like a reality TV show "When good clients go bad". He (or she) only read part of the memo, apparently. Very good points. We're living in a time of people wanting instant gratification, so buying and waiting for the work to be done isn't so attractive. Michelle - wonderful post. Just one point from the seller's perspective, sometimes the reason the repairs aren't done is because the seller is short on cash to make those repairs. What a balance! thank you for so eloquently stating what I have known inside my head but never could put in words. I stress to sellers that the first impression is the strongest and that having a ready-to-move-in house is priceless. I'm going to bookmark this post for future reference! Marte: That's true. Also buyers just don't have the money with higher downpayment requirements and all. Penny: I think many home sellers could find some money if they really wanted to. They may not be able to complete all the repairs, but there are many they could do themselves if they tried. Jeannine: I'm glad I could help! Michelle - Just watched a Christmas movie over the weekend that involved a person becoming homeless. She made a friend that had experience in mortgages that had been laid off. Circumstances led to her getting her Realtor license living in a home that was up for sale, furnishing it with items from a rental company and it became her first sale. Buyers offered list price for the house plus an additional amount to keep the house furnishings!! Your post puts some reality to what buyers are looking for. Merry Christmas! Michelle- congrats on the feature and you did a perfect job of showing exactly why carpet or any other allowances just won't work in today's market! Bob: Put that movie in my Christmas stocking! What a great story. Thanks for sharing it. Kathy: I'm always surprised when I hear the allowance line. I hope sellers will see that its in their best interest to make their home as pretty as can be before listing. Hi Michelle, Congratulatins on a terrific featured post. Great points eloquently put. I'm sure many will reblog this one. It's so appropriate to conversations REA's need to have with sellers. Also love your "Allowances are for teenagers" and Kathy Nielsen's "we want to give the buyers every reason to buy and not a single reason not to." Allowances are so passe and especially in this age of massive foreclosure numbers, lots of inventory, record low interest rates, it just makes no sense to put a property on the market other than in tip top shape and a professional home staging consultation is the most cost-effective way to get there. Michelle, you have hit the nail on the head. I've had this conversation with so many sellers. They seem to think that making an allowance is so much better than investing in "selling" their home. I wish I had a dollar for every time I heard "I don't want to put any more money/work into this place." Urrgg! Pat: It doesn't make sense to put a home on the market that hasn't been properly prepared, but people do it anyway. Happy Holidays, Pat. Sharon: A large part of what we do is to help homeowners prepare their homes for sale. If they reject that help, there's not much we can do. I share your frustration. This is good information. Sellers right now need to do everything up front to make their house stand out. Most people just can't visualize how it will look and move on to the next house. So true. I have learned this the hard way over the years, and try to pass it along to sellers! Thanks. Thanks for taking the time to comment, Tigard. Jan: I think any one who works in real estate encounters this frequently. Allowances give a negative impression before the prospective seller walks in the door! Great post Michelle!! Getting excited to see you in Vegas!! Your case is very well stated. Putting ourselves in the mind of the prospective buyer is a worthwhile exercise. I agree with people wanting move in ready, no fuss - no muss. As you say, buyers often want the house they've purchased to look the same when they move is because they recognize the way a professional stager has analyzed the traffic flow, and presented each room with balance and appeal. The staging not only represents the best features of the house but also creates the appeal of a place you can't wait to live! Thanks Michelle excellent educational presentation for the Seller. If Mr Buyer can't buy a new house he wants something that looks new. Encouraging the Seller to think like a Buyer can give them a different perspective. Margaret C.
Cathy: That's very true. Allowances inform buyers that you are admitting in advance that your home is less than it should be. Jan: Very true. I often have home buyers wanting to purchase the home as staged. Margaret: We all want the best our money can buy. Most people will choose a lesser house in excellent condition than a bigger home that needs work. Great post...so true! Allowances are a thing of the past. If the seller works with a good stager they can put the allowance to better use and make a huge impact on the salability of the home!